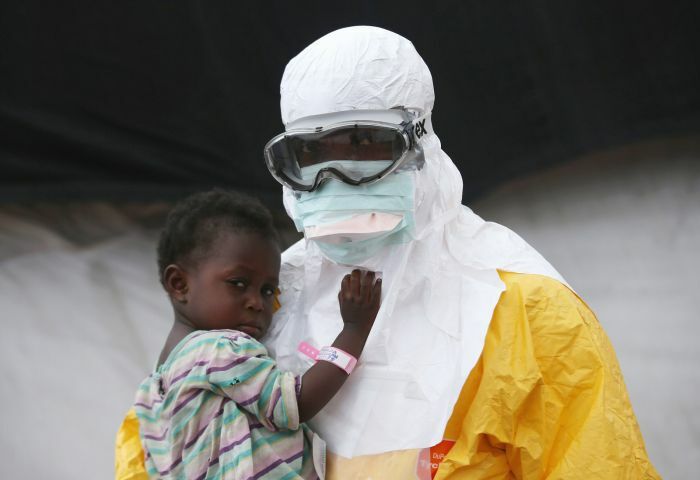 A Doctors Without Borders (MSF) worker in protective clothing holds a child suspected of having Ebola at a treatment center in Paynesville, Liberia, on Oct. 5. 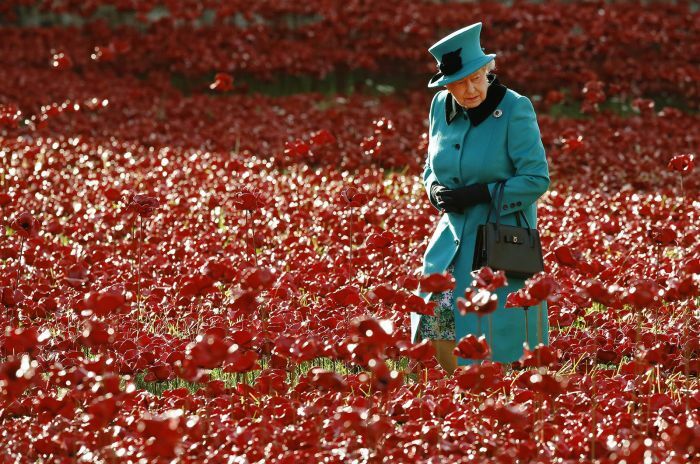 Britain’s Queen Elizabeth walks through a field of ceramic poppies that form part of the art installation “Blood Swept Lands and Seas of Red” in London on Oct. 16. 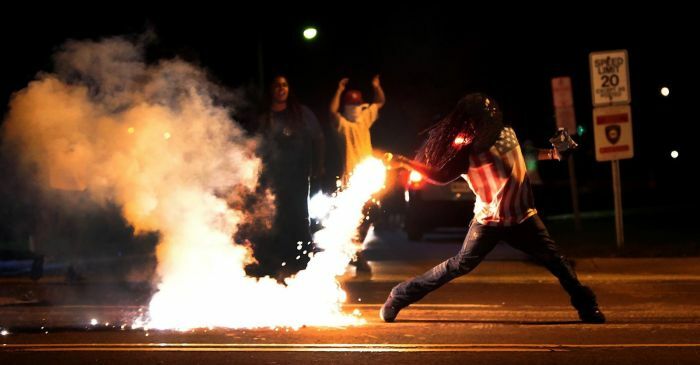 A demonstrator throws a tear gas container back at police officers in Ferguson, Missouri, on Aug. 13. 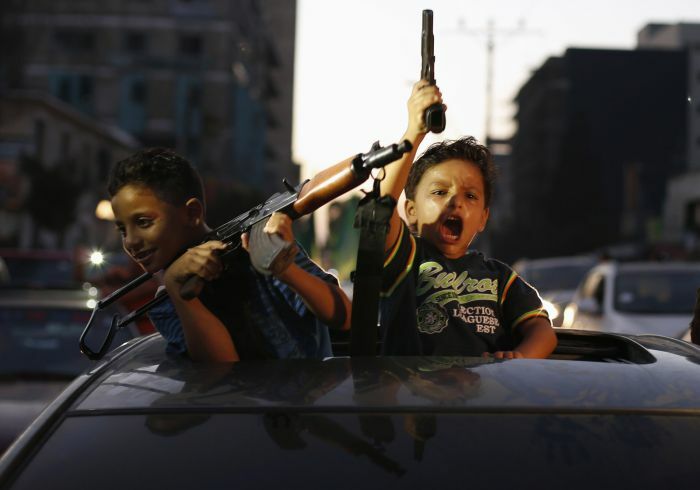 In this Sept. 6, 2014 photo, Rev. 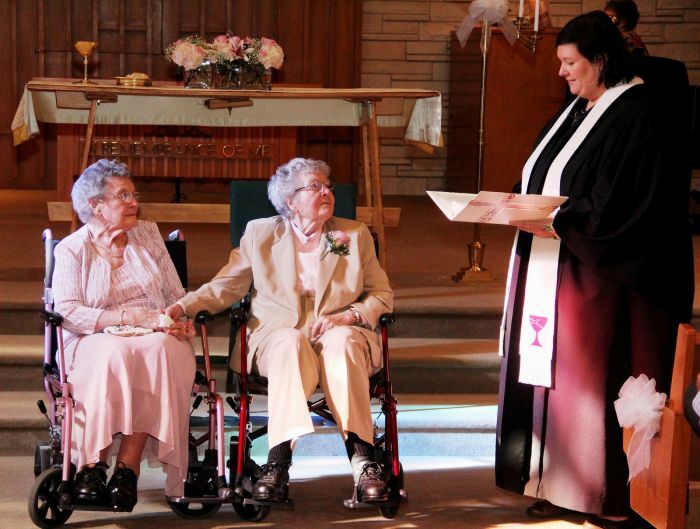 Linda Hunsaker presides over the wedding of Vivian Boyack (left) and Alice Dubes (center), in Davenport, Iowa. More than seven decades after beginning their relationship, Boyack, 91, and Dubes, 90, finally got married. 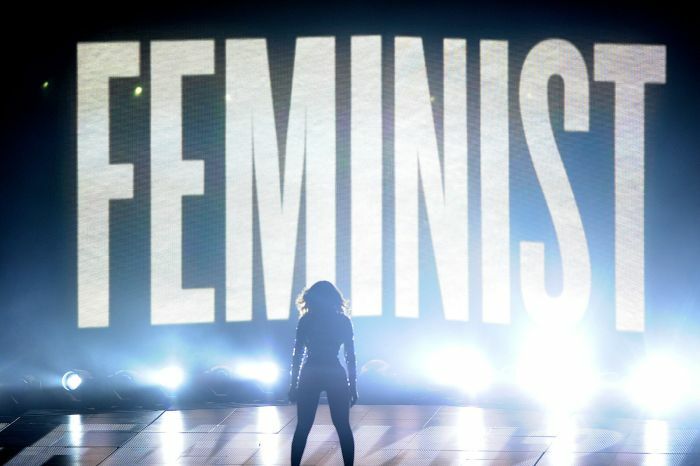 Beyonce performs onstage at the 2014 MTV Video Music Awards at The Forum on Aug. 24, in Inglewood, California. 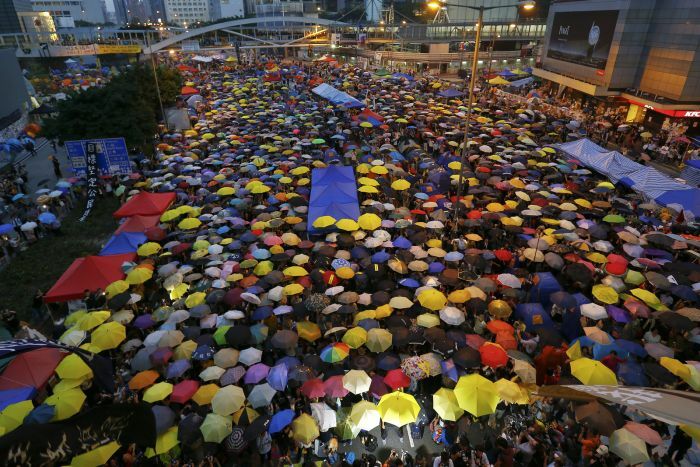 Protesters open their umbrellas, symbols of pro-democracy movement, as they mark one month since they took to the streets in Hong Kong’s financial district on Oct. 28. 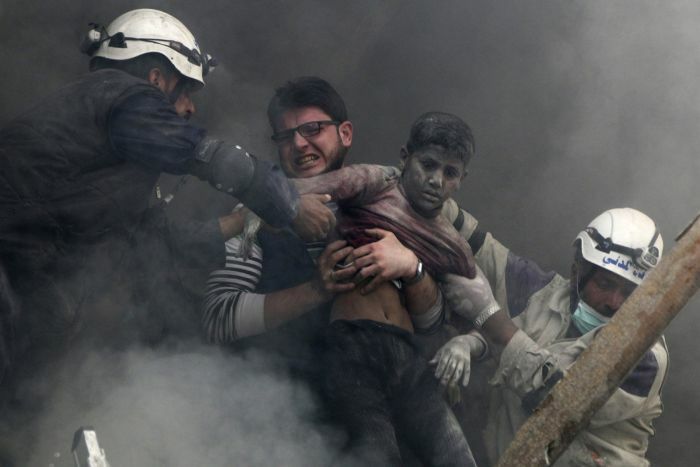 Men rescue a boy after activists said forces loyal to Syria’s President Bashar Al-Assad dropped explosive barrels in Aleppo on April 6. 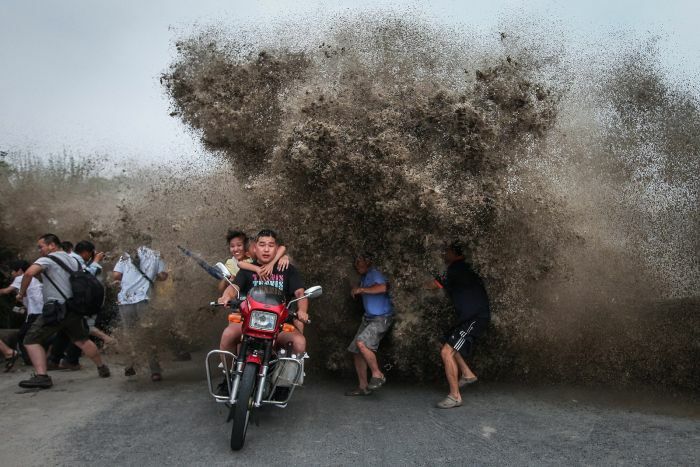 A high wave hits the bank of Qiantang River in China’s Hangzhou, Zhejiang, province on Aug. 13. 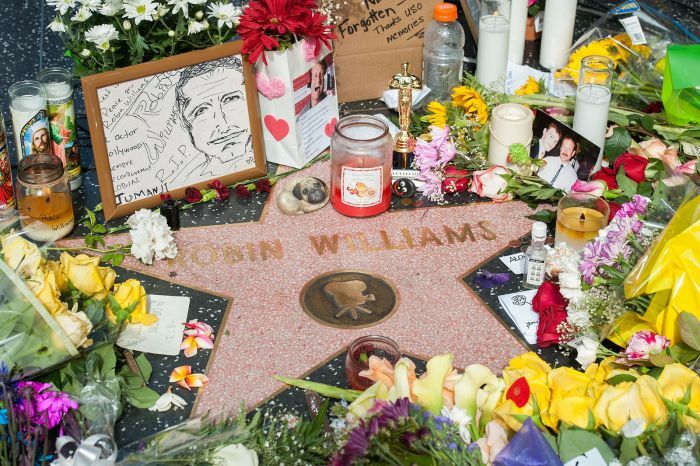 Flowers were placed on Robin Williams’ Hollywood Walk of Fame star on Aug. 12 in Los Angeles, California. 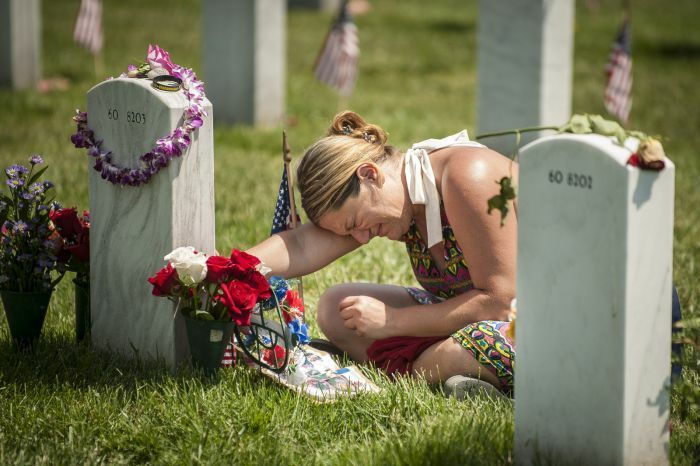 Laura Youngblood weeps over the grave of her husband, Travis L. Youngblood, during Memorial Day at Arlington National Cemetery in Virginia on May 26. 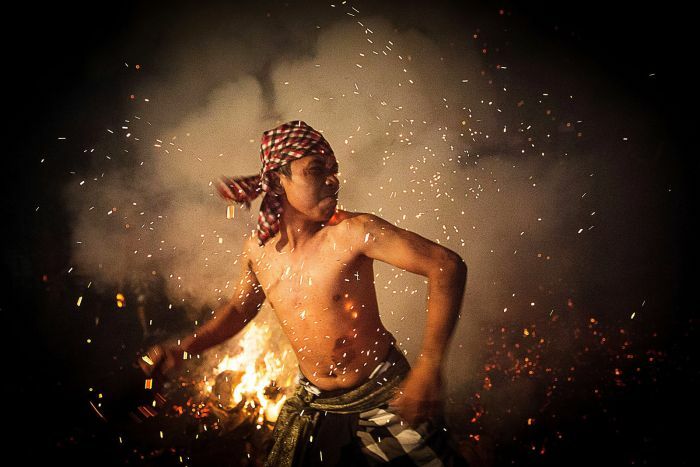 A Balinese man throws a burned coconut husk during the “Mesabatan Api” ritual ahead of Nyepi Day on March 30, in Gianyar, Bali, Indonesia. 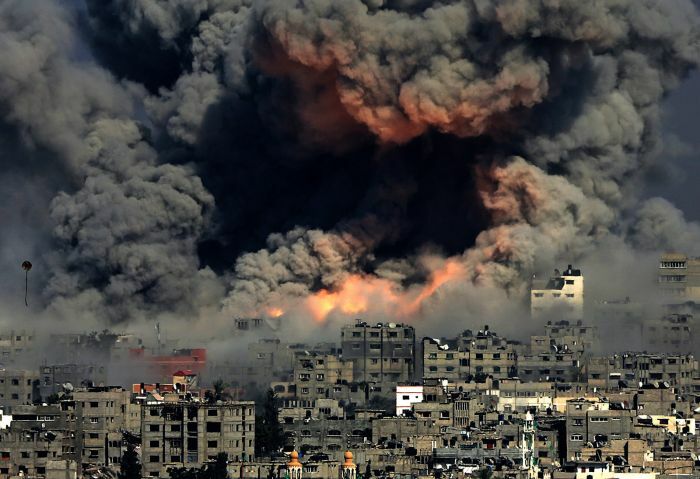 Smoke rises from Tuffah neighborhood after Israeli air strikes in Gaza City on July 29. 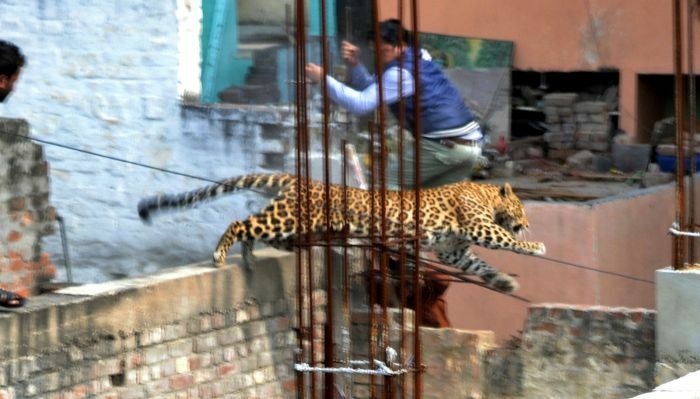 A leopard leaps across an under-construction structure near a furniture market in the Degumpur residential area as a bystander moves out of the way in Meerut on Feb. 23. 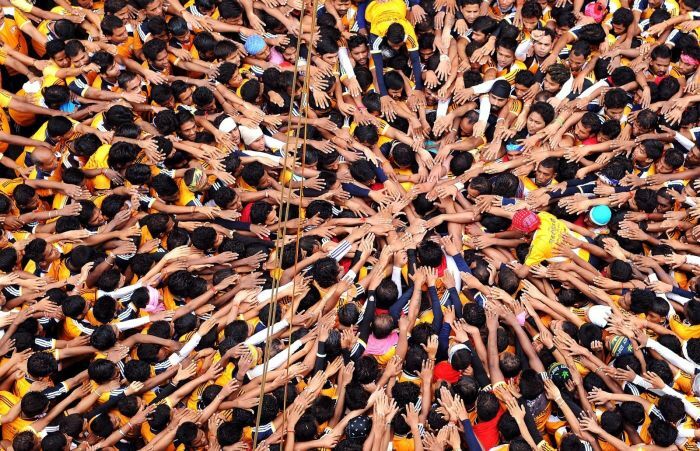 Indian Hindu devotees gesture before attempting to form a human pyramid during celebrations for the Janmashtami festival, marking the birth of Hindu god Lord Krishna, in Mumbai, on Aug. 18. 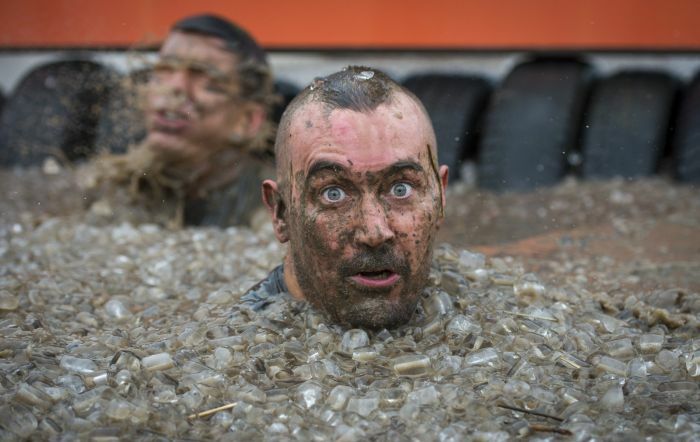 Competitors take part in the Tough Mudder London South on Oct. 25, in Winchester, England. 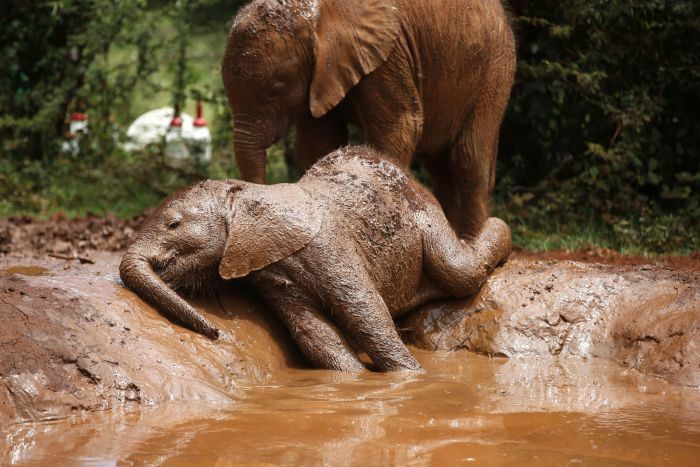 An orphaned baby elephant basks in a mud puddle at the David Sheldrick Elephant Orphanage in Nairobi National Park on Oct. 15. 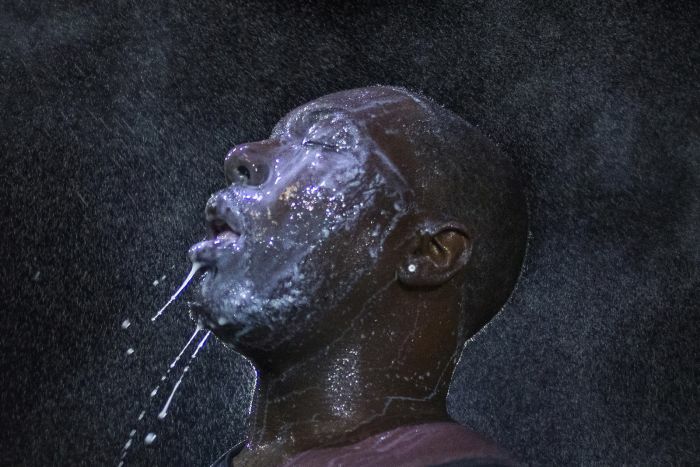 A man is doused with milk and sprayed with mist after being hit by an eye irritant from security forces trying to disperse demonstrators in Ferguson, Missouri, on Aug. 20. 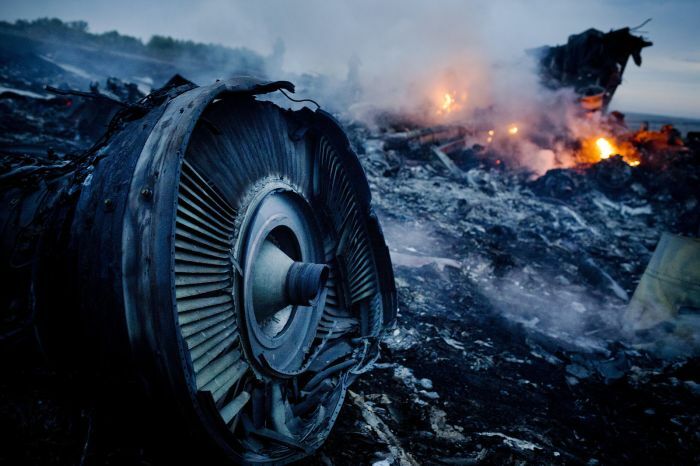 Smoldering debris from Malaysia Airlines Flight 17 in a Ukraine field on July 17. 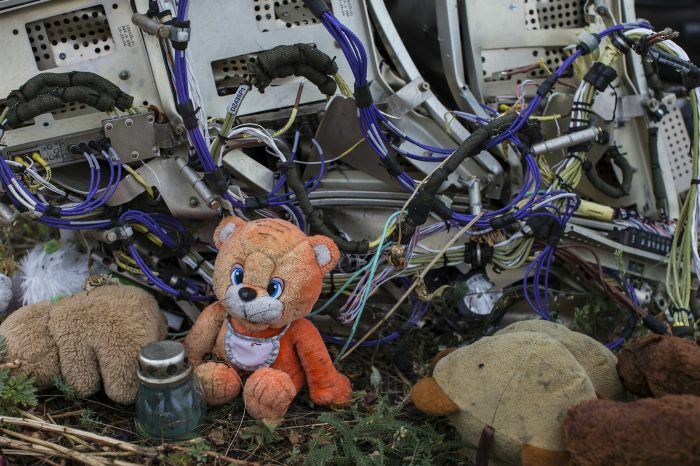 A teddy bear is found next to the wreckage at the site of the downed Malaysia Airlines 17 in eastern Ukraine’s Donetsk region on Sept. 9. 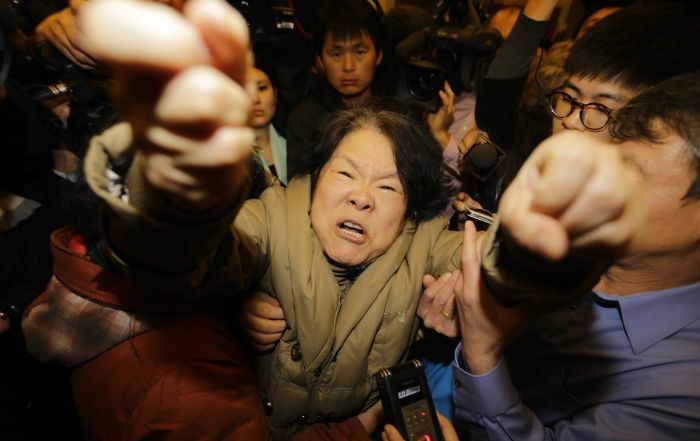 A family member of a passenger from Malaysia Airlines Flight 370 shouts at journalists at the Lido hotel in Beijing on March 24. 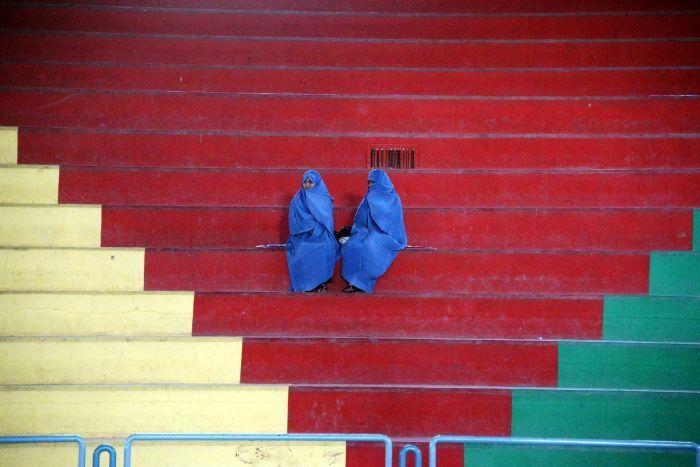 Afghan women sit in the rafters as they watch girls compete in a taekwondo match in Herat on Nov. 13. 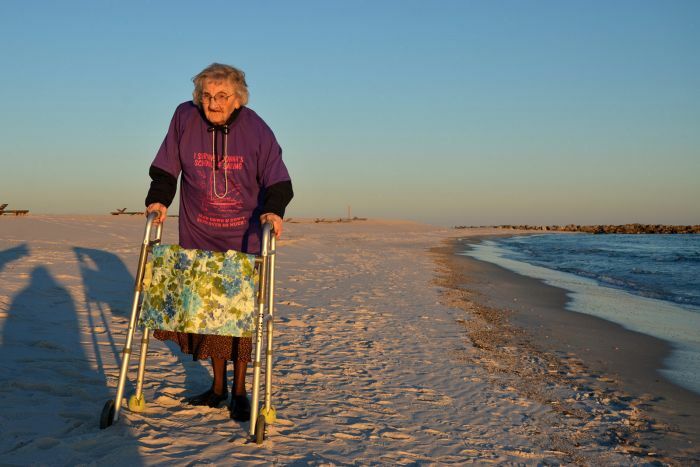 Ruby Holt, 100, of Columbia, Tennessee, visited the beach for the first time in her life this week in at the Perdido Beach Resort in Orange Beach, Alabama on Nov. 19. 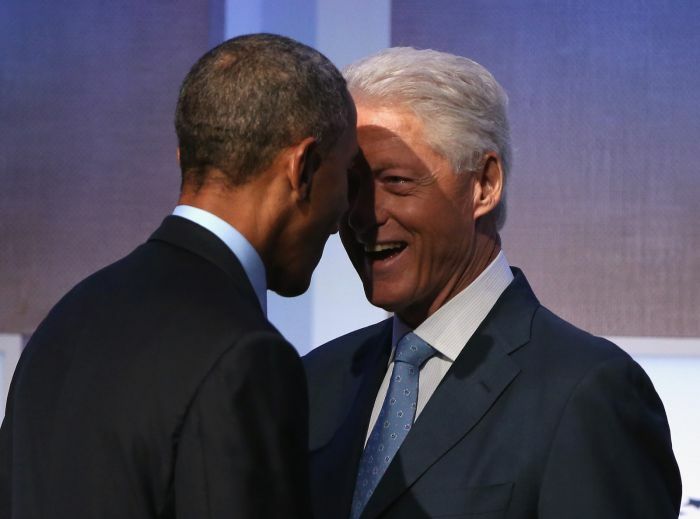 U.S. President Barack Obama and former U.S. President Bill Clinton speak before Obama’s speech at the Clinton Global Initiative on Sept. 23, in New York City. Miley Cyrus performs onstage during her Bangerz Tour at Rogers Arena on Feb. 14, in Vancouver, Canada. 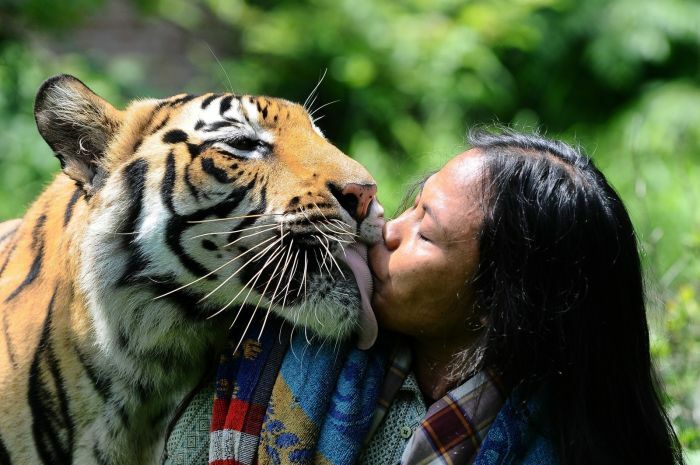 Mulan Jamilah, a 6-year-old Bengal tiger, kisses caretaker Abdullah Sholeh, 33, in the garden beside their home on Jan. 20, in Malang, Indonesia. 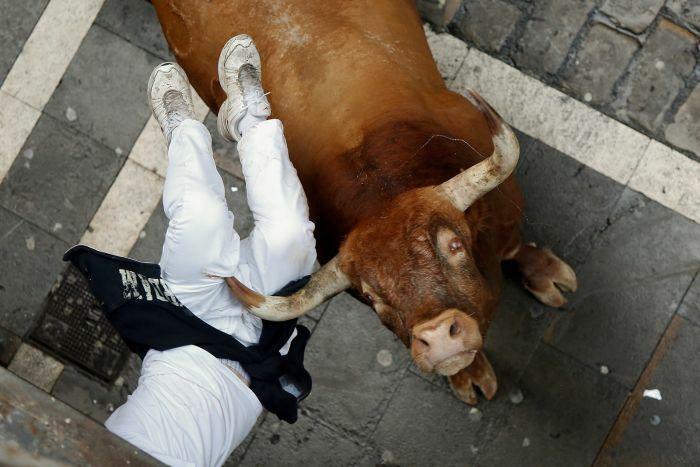 A Miura’s fighting bull horns a runner at Calle Estafeta during the ninth day of the San Fermin Running Of The Bulls festival on July 14 in Pamplona, Spain. 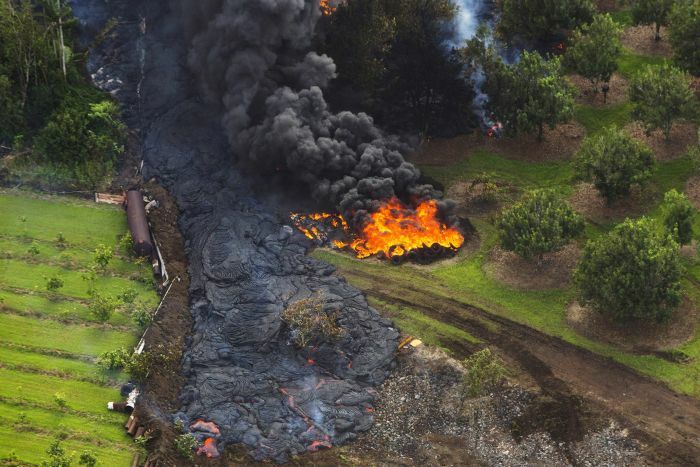 The June 27 lava flow from the Kilauea Volcano moves along he ground Oct. 28, in Pahoa, Hawaii. 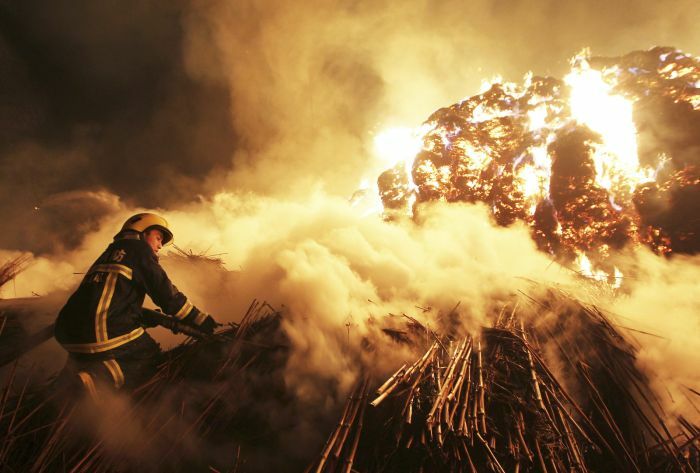 Molten rock from the flow is inching its way towards homes in the town of Pahoa on Hawaii’s Big Island where close to a thousand people live. 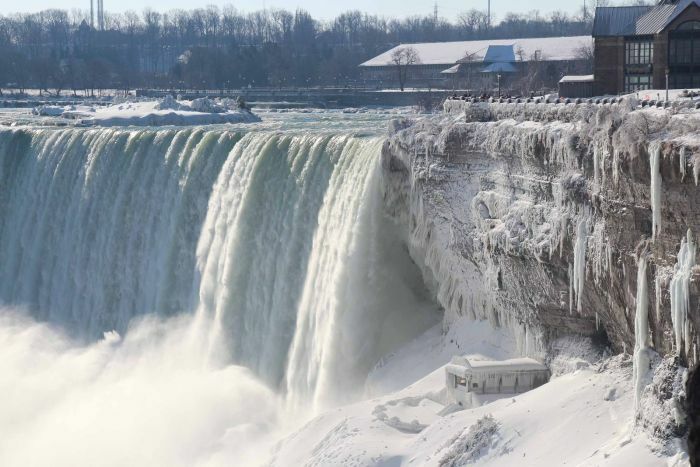 A view of Niagara Falls frozen over due to the extreme cold weather, Ontario, Canada, Jan. 9. The Polar Vortex brought record cold temperatures to United States and Canada. 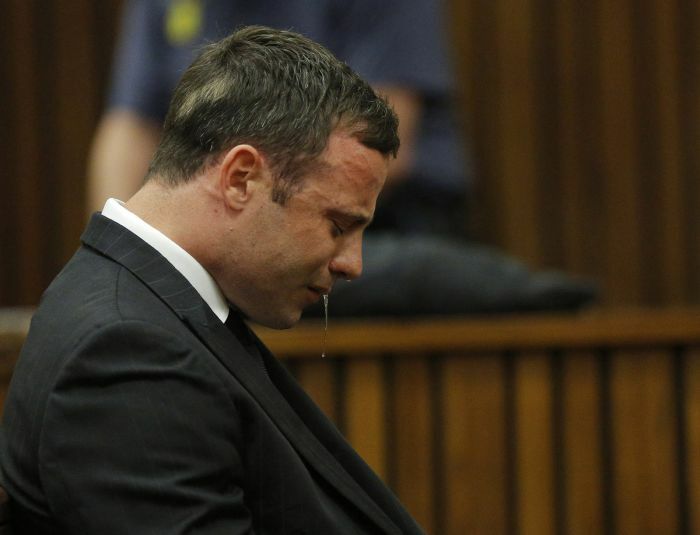 Olympic and Paralympic track star Oscar Pistorius reacts as he listens to Judge Thokozile Masipa’s judgement at the North Gauteng High Court in Pretoria, Sept. 11. 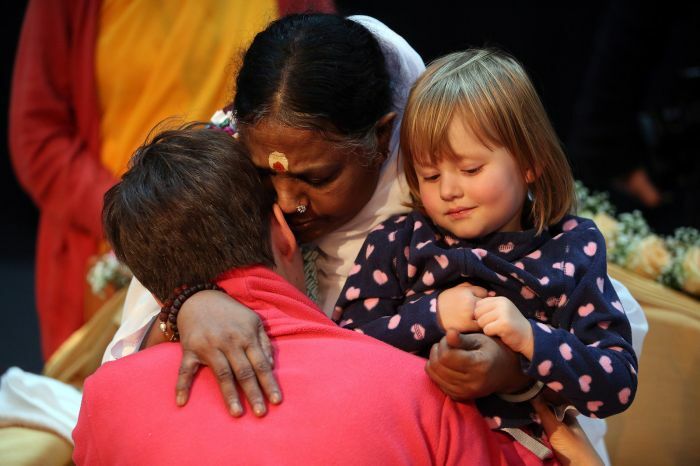 Mata Amritanandamayi Devi, primarily known simply as Amma (“Mother”), the hugging saint, hugs a devotee and 2-year-old Elena in the event hall Arena, on Nov. 12, in Berlin, Germany. 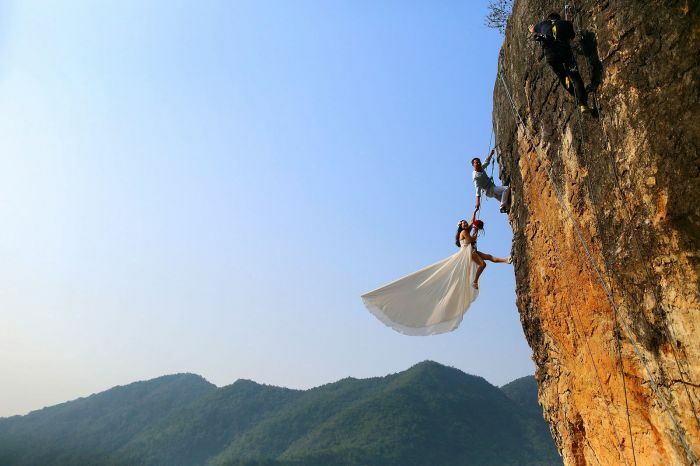 Zheng Feng, an amateur climber, takes wedding pictures with his bride on a cliff in Jinhua, Zhejiang, province, China, on Oct. 26. 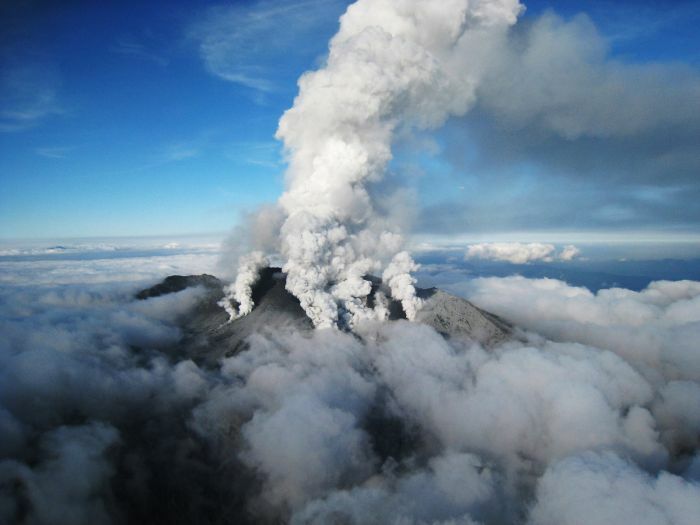 White smoke rising from Mount Ontake as Japan’s volcano Ontake erupts in Nagano prefecture, central Japan. Dozens of hikers were stranded on the slopes of an erupting Japanese volcano that reportedly killed one person and left 30 more seriously injured, Sept. 27. 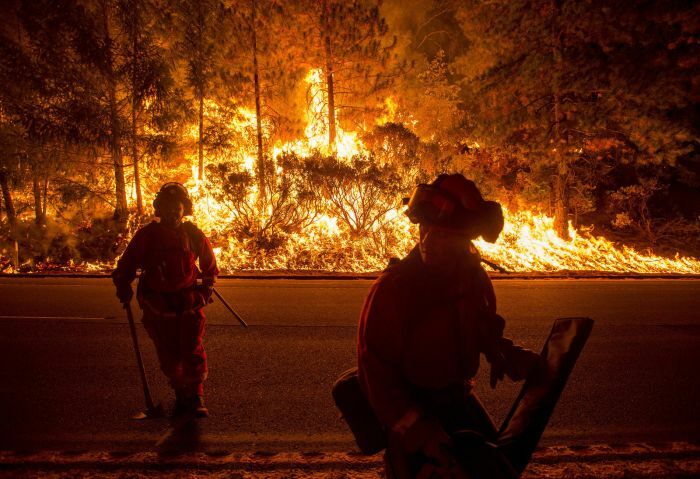 Firefighters battling the King Fire watch as a backfire burns along Highway 50 in Fresh Pond, California, on Sept. 16. 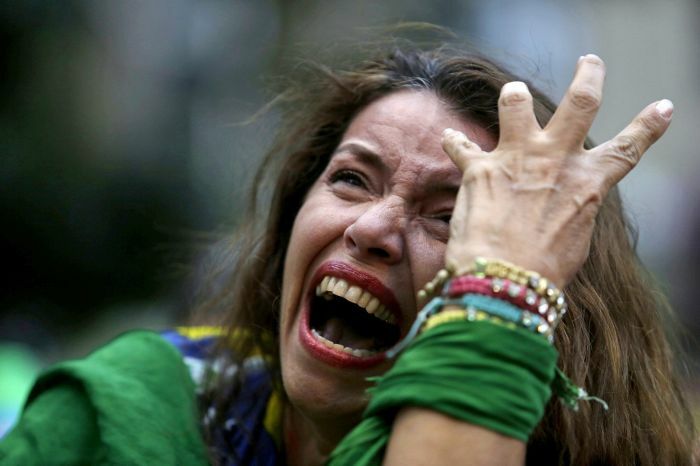 A Brazil soccer fan cries as Germany scores against her team at a semifinal World Cup match as she watches the game on a live telecast in Belo Horizonte, Brazil, Tuesday, July 8. 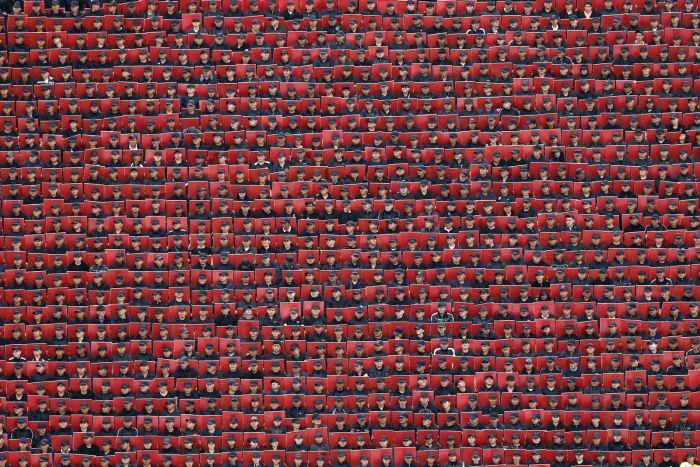 Troops hold colored cards during a military parade celebrating Independence Day at the Zocalo square in downtown Mexico City, Sept. 16. 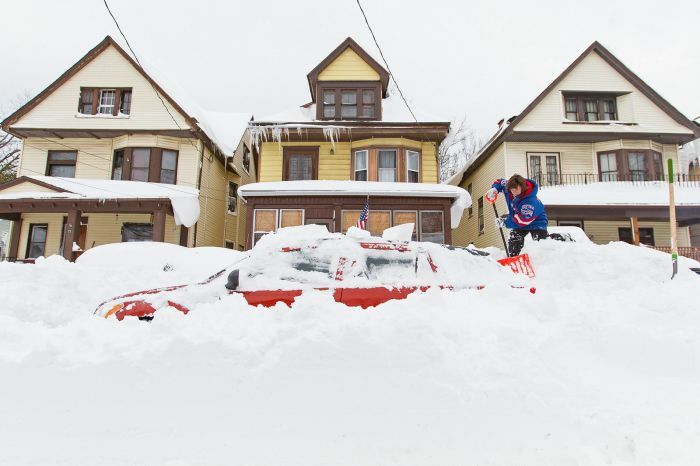 Lori Weishaar shovels snow from around her vehicle following an autumn snow storm in Buffalo, New York, Nov. 20. 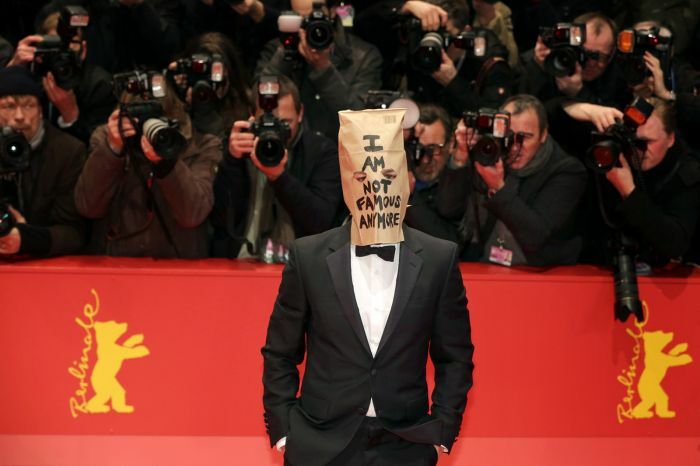 Actor Shia Labeouf wears a paper bag over his head reading “I am not famous anymore” as he arrives for the screening of “Nymphomaniac Volume I” at the 64th Annual Berlin Film Festival, in Berlin, Germany, Feb. 9. 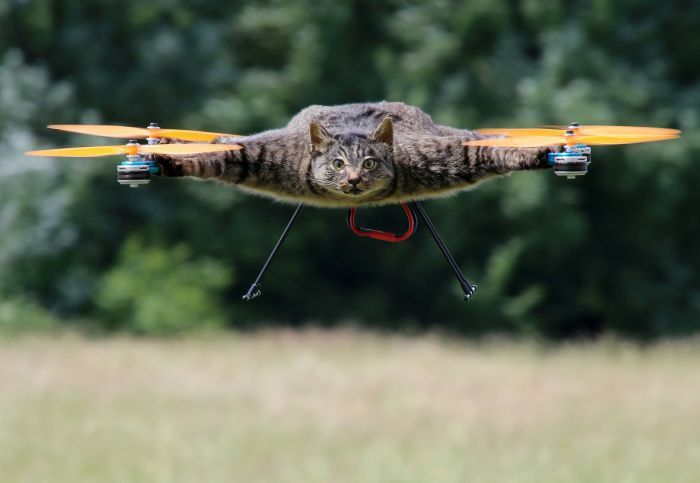 Should be: Dutch artist Bart Jansen turns his dead cat into a remote-controlled helicopter, June in London, Britain. 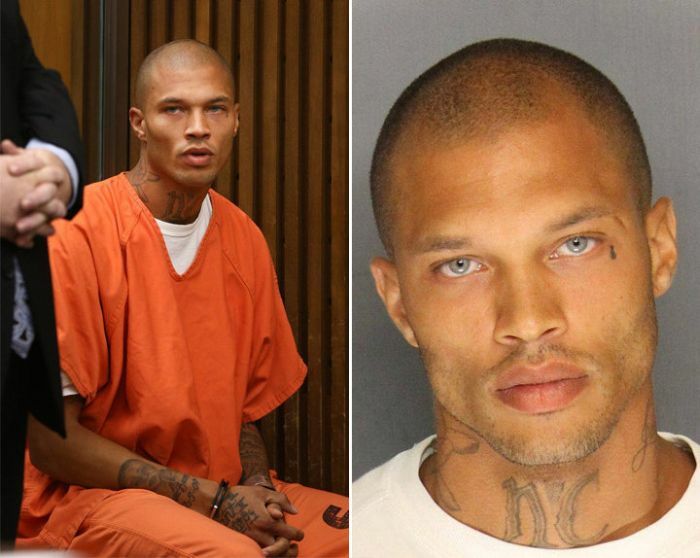 Jeremy Meeks makes a court appearance July 8, in Stockton, California. During his brief appearance the state agreed to let federal prosecutors take over Meeks’ case. Meeks was arrested on felony weapon charges June 18 as part of a Stockton police gang sweep. His booking photo was posted to the Stockton police Facebook page and has garnered media attention and secured him a Hollywood agent due to his model-like features. 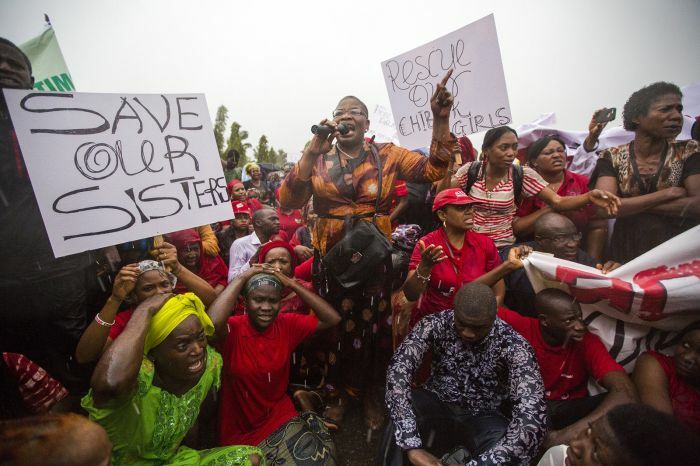 Women rally In nigeria to demand more action for 200 kidnapped girls on May 1. At midnight on April 15, 234 girls were kidnapped from their dorm room in Chibok, in northeastern Nigeria, by Islamic militant group Boko Haram. 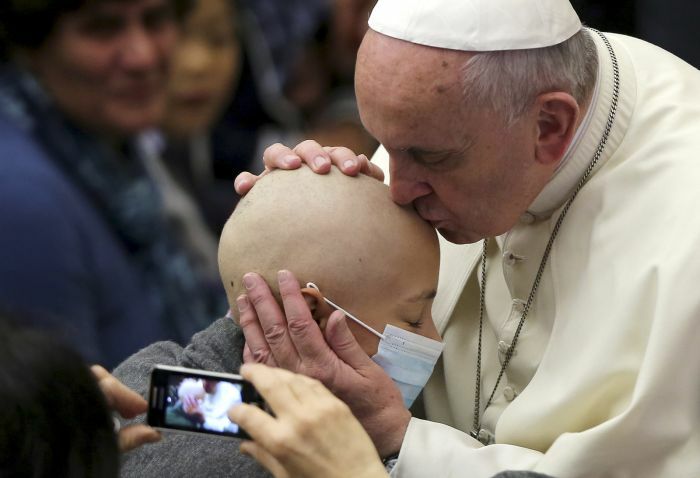 Pope Francis (right) kisses a girl during a special audience with business consultants at the Paul VI hall at the Vatican, Nov. 14. 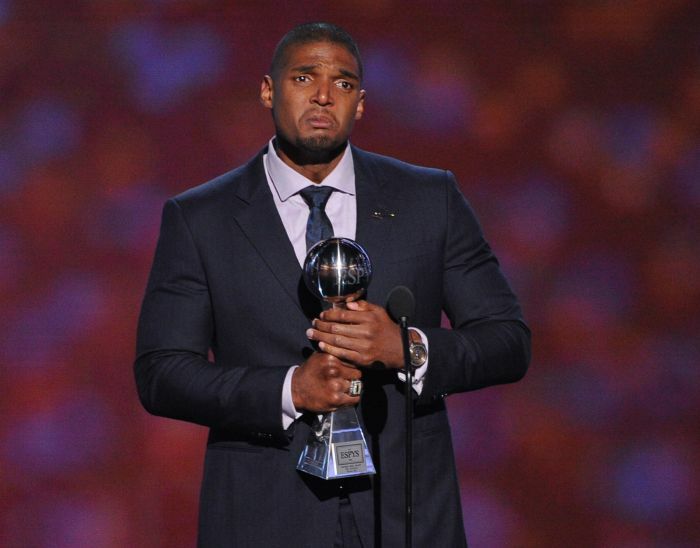 The first out gay NFL player, Michael Sam, accepts the Arthur Ashe Courage Award onstage during the 2014 ESPYS at Nokia Theatre L.A. Live on July 16, in Los Angeles, California. 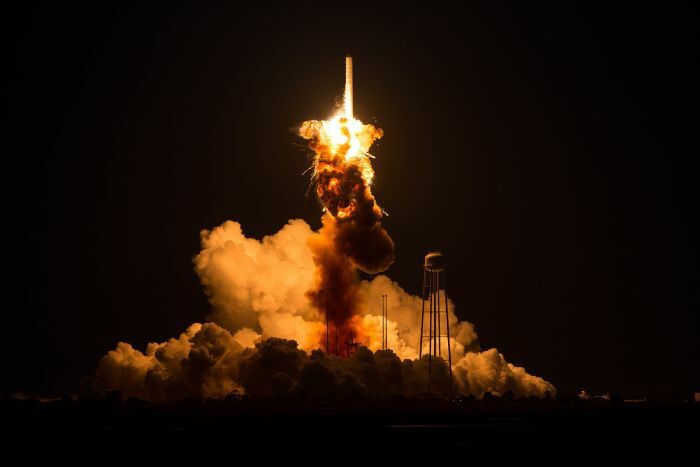 The Orbital Sciences Corporation Antares rocket, with the Cygnus spacecraft on board suffers a catastrophic anomaly moments after launch from the Mid-Atlantic Regional Spaceport Pad 0A at NASA Wallops Flight Facility on Oct. 28 on Wallops Island, Virginia. 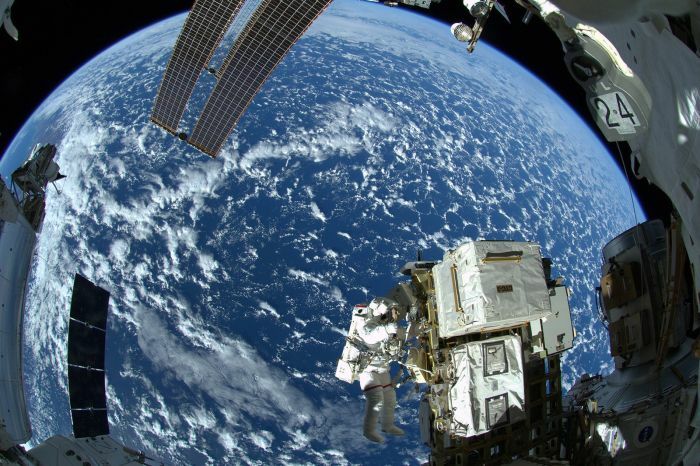 NASA astronaut Reid Wiseman works outside the space station’s Quest airlock for the Expedition 41 crew aboard the International Space Station in this image released Oct. 8. 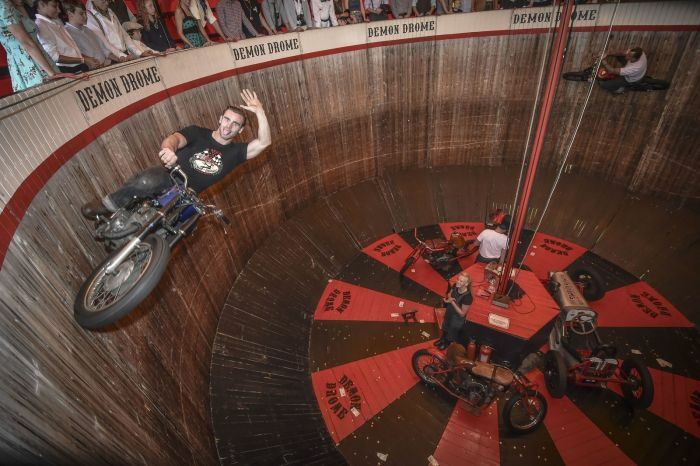 Dave Seymour and son Duke ride the wall of death, a family-run “Demon Drome” stunt attraction in Cornwall, Britain, on Sept. 13. 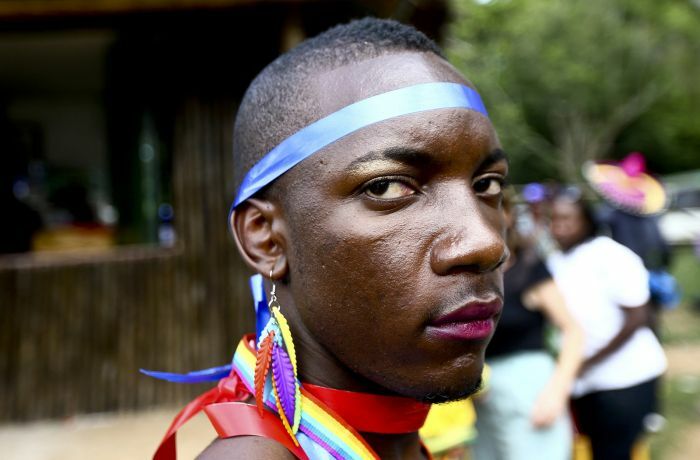 A man is pictured as he prepares for a parade to celebrate the annulment of an anti-homosexuality law by Uganda’s constitutional court in Entebbe, Aug. 9. 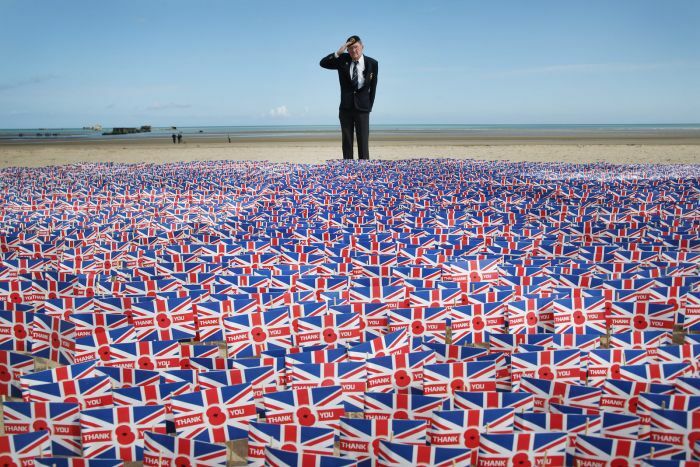 WWII veteran Fred Holborn, from the Fleet Air Arm, salutes as he looks at British Legion Union flags carrying thank you messages planted in the sand on Gold Beach on June 5, near Asnelles, France. 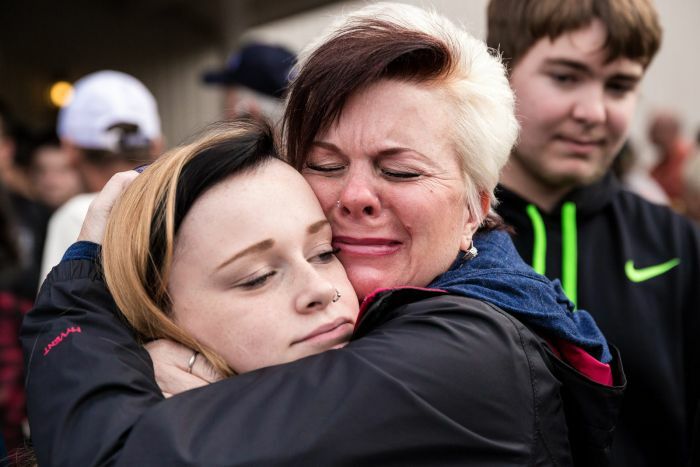 Colleen Epstein, (right) embraces her daughter, Meaghan Epstein (left), a junior at Marysville Pilchuck High School, near the scene of a school shooting that left two dead and four wounded Friday, Oct. 24, at Marysville Pilchuck High School in Marysville, Wash. 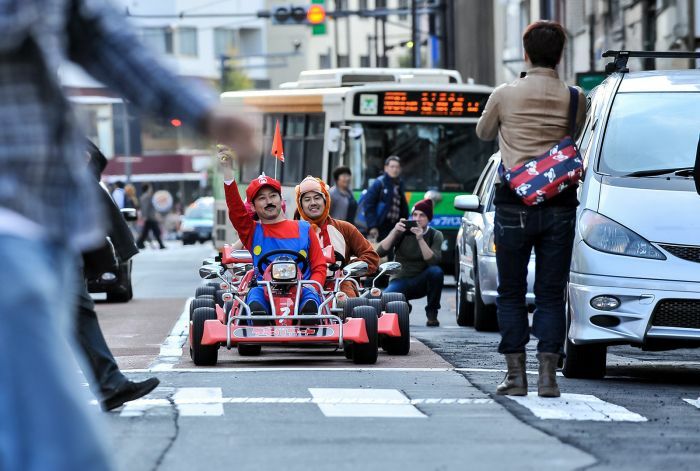 Participants drive around Tokyo as Mario Kart characters for the Real Mario Kart event in Tokyo on Nov. 16, in Tokyo, Japan. 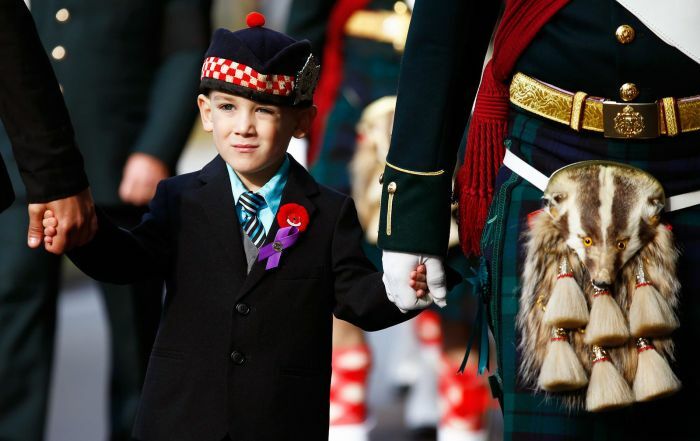 Marcus Cirillo, 5, attends the funeral procession for his father, Cpl. Nathan Cirillo, in Hamilton, Ontario, Oct. 28. 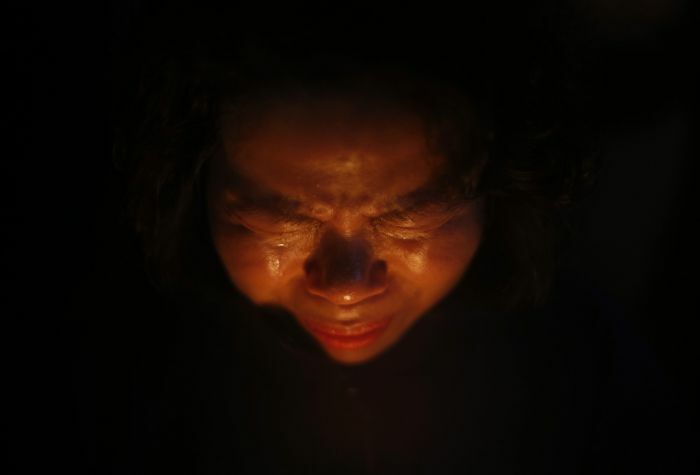 A woman cries while praying during a candlelight vigil in Ansan, to commemorate the victims of capsized passenger ship Sewol and to wish for the safe return of missing passengers, April 23. Singer Justin Bieber is photographed by police while in custody on Jan. 23, in Miami Beach, Florida. 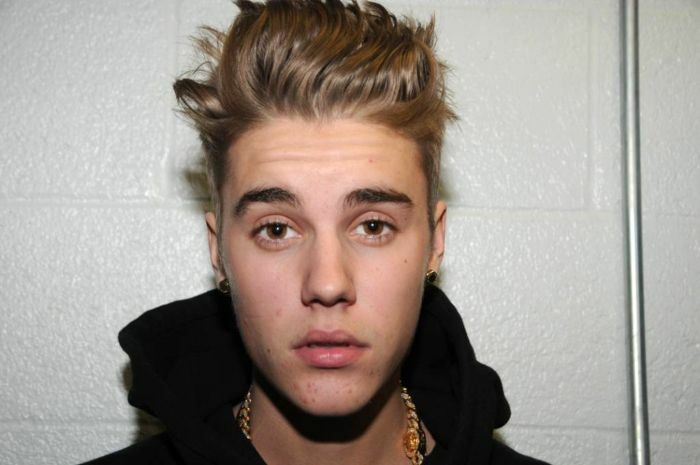 Justin Bieber was arrested for driving under the influence, resisting arrest, and driving without a valid driver’s license. 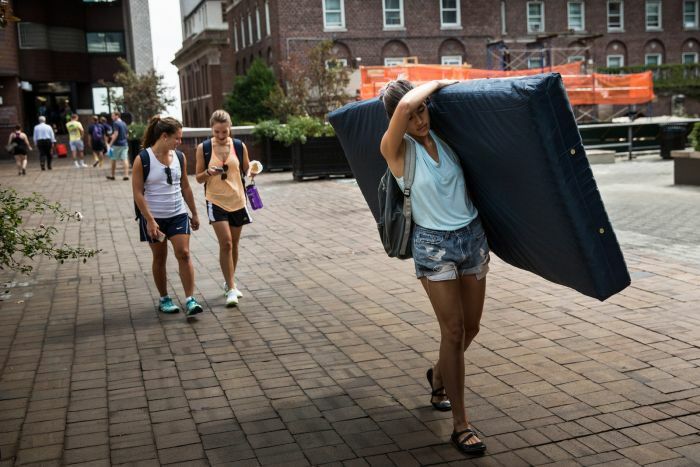 Emma Sulkowicz, a senior visual arts student at Columbia University, carries a mattress in protest of the university’s lack of action after she reported being raped during her sophomore year on Sept. 5, in New York City. 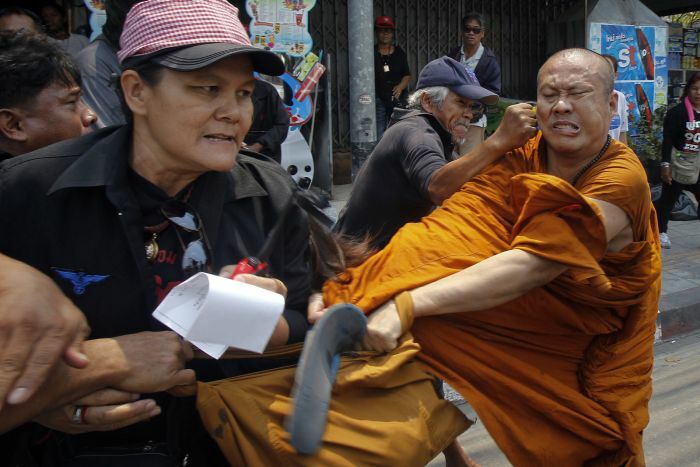 Members of the pro-government “red shirt” movement attack a Buddhist monk outside the National Anti-Corruption Commission office in Nonthaburi province, on the outskirts of Bangkok, March 24. 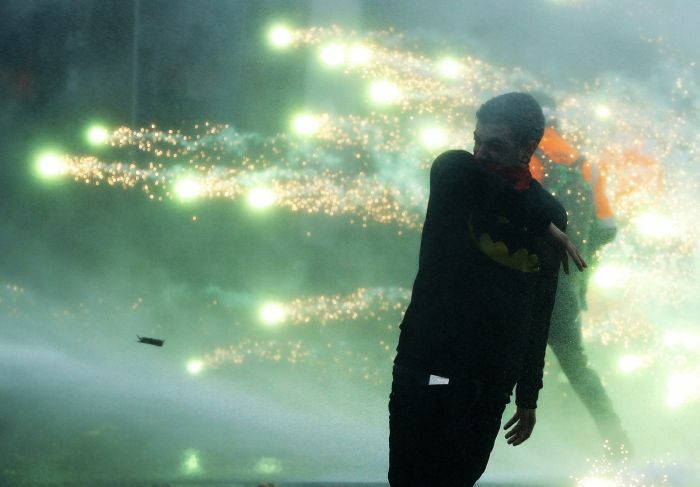 Demonstrators confront riot police in central Brussels, Nov. 6. Tens of thousands of public and private sector workers, employees, and trade union members demonstrated over austerity measures to be taken by the new Belgian government. 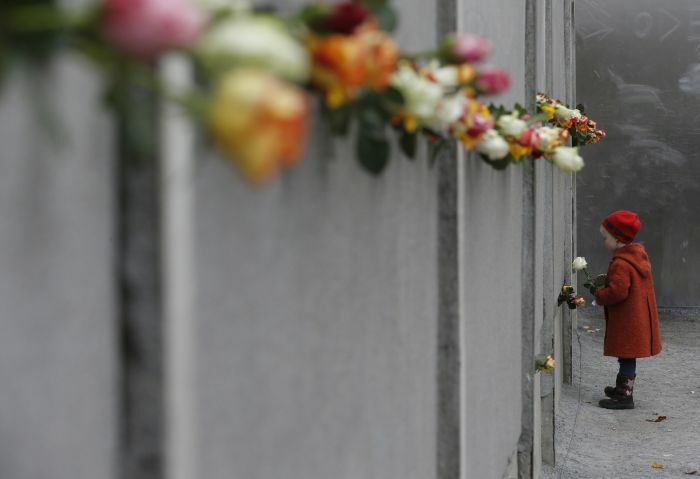 A young girl places a rose at the Berlin Wall memorial in Bernauer Strasse, during a ceremony marking the 25th anniversary of the fall of the Berlin Wall, in Berlin, Germany, Nov. 9. 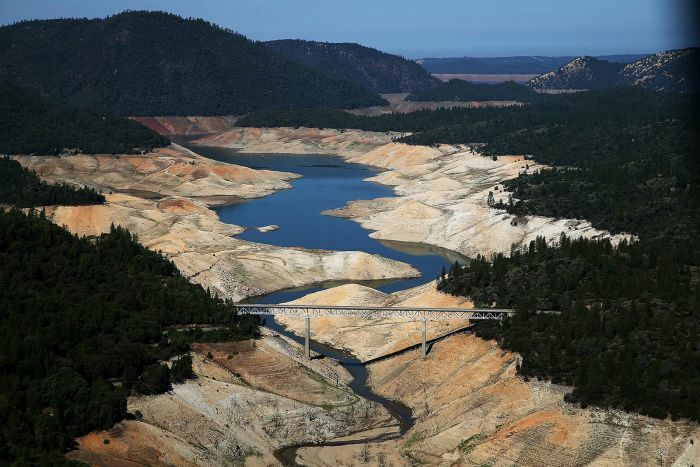 A section of Lake Oroville is seen nearly dry on Aug. 19, in Oroville, California. 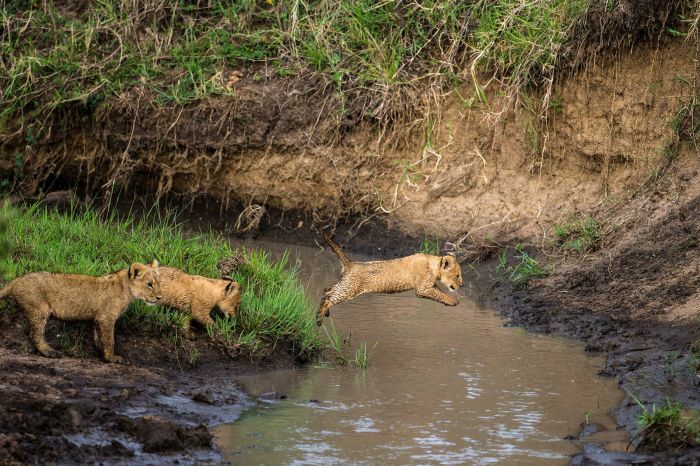 These pictures show reluctant lion cubs being cajoled into jumping across a stream on Oct. 20, in Masai Mara, Kenya. 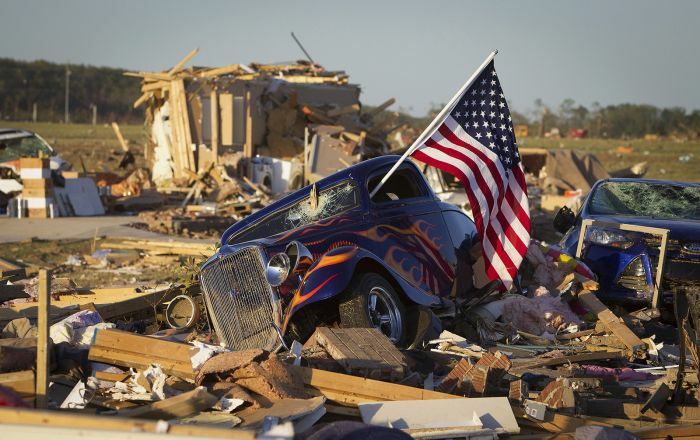 A U.S. flag sticks out the window of a damaged hot rod car in a suburban area after a tornado near Vilonia, Arkansas, April 28. 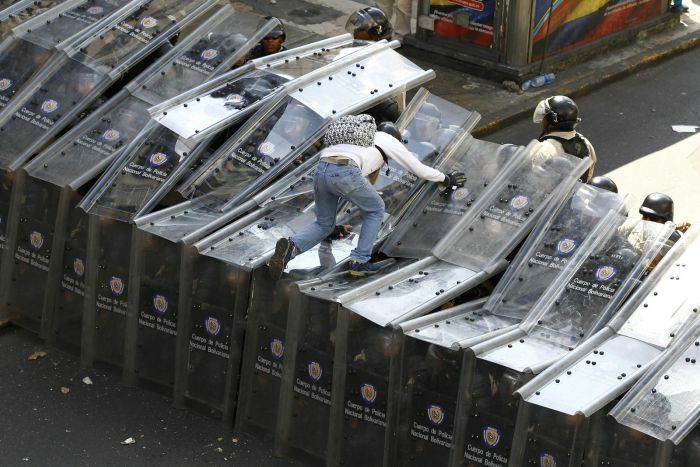 A demonstrator jumps on a shield wall formed by riot police during a protest against Venezuela’s President Nicolas Maduro’s government in Caracas, Feb. 12. 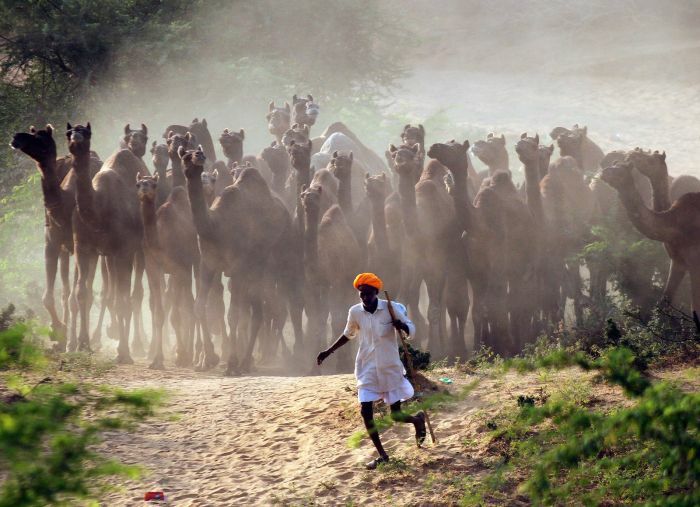 A camel herder walks his camels at Pushkar Fair in the desert Indian state of Rajasthan, Oct. 28. 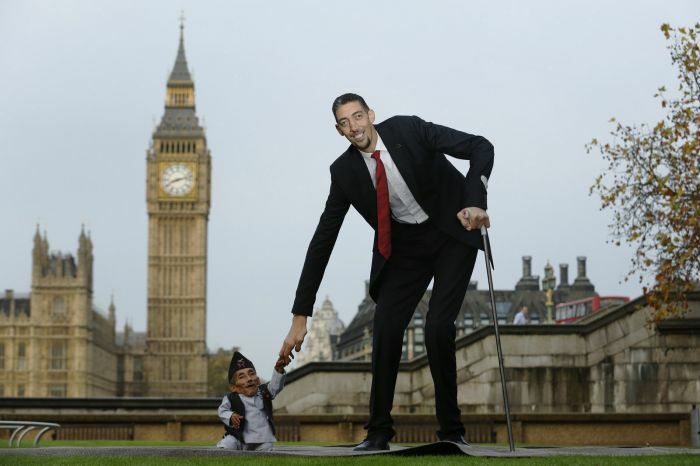 The world’s shortest man Chandra Bahadur Dangi greets the tallest living man, Sultan Kosen, to mark the Guinness World Records Day in London, Nov. 13. 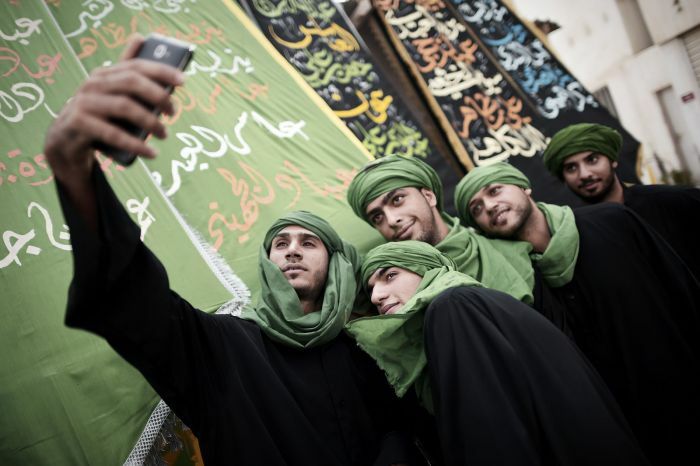 Bahraini Shiite Muslims pose for a selfie during a ceremony marking Ashura, which commemorates the 7th-century slaying of Imam Hussein, the grandson of Prophet Mohammed, in the village of Sanabis, west of Manama, on Nov. 4. 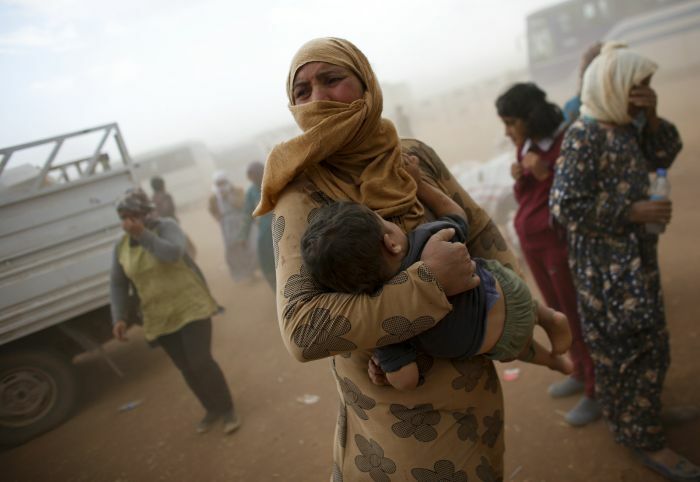 A Kurdish Syrian refugee waits for transport during a sandstorm on the Turkish-Syrian border near the southeastern town of Suruc in Sanliurfa province, Sept. 24. 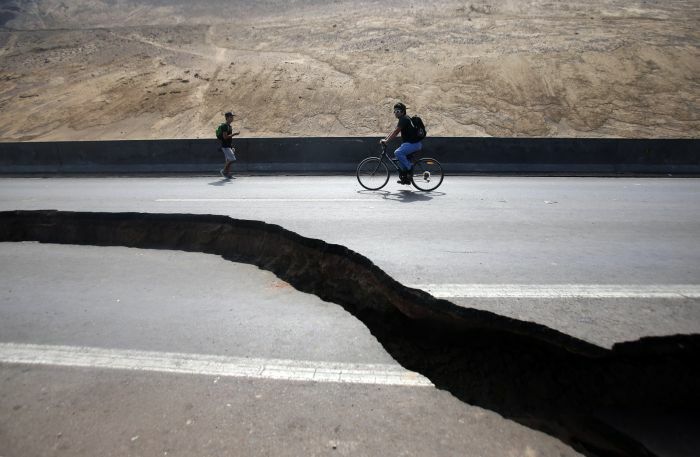 Two men pass by a crack in a highway between the localities of Iquique and Alto Hospicio, Chile, April 3. 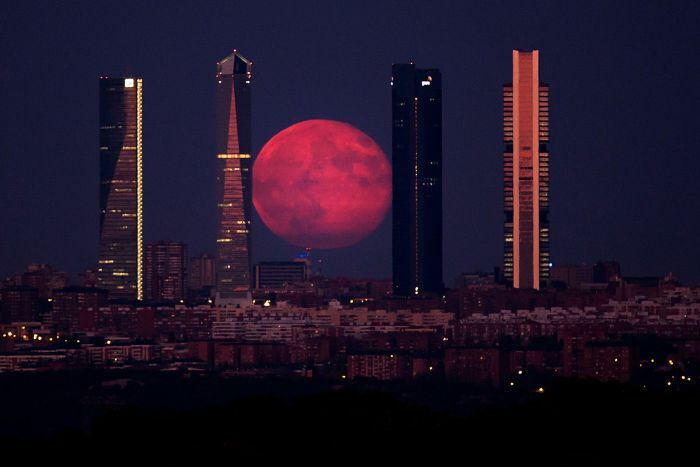 The moon shines through the Four Towers Madrid skyscrapers on Aug. 11, in Madrid, Spain. 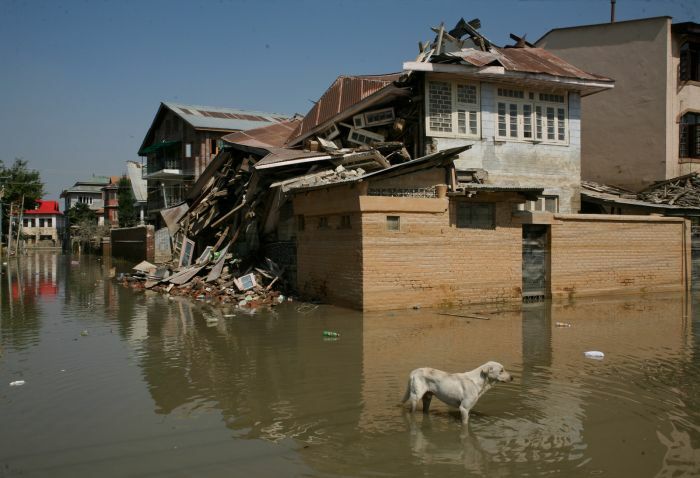 A stray dog stands in front of a destroyed home submerged in flood waters on Sept. 30, in Srinagar, India. 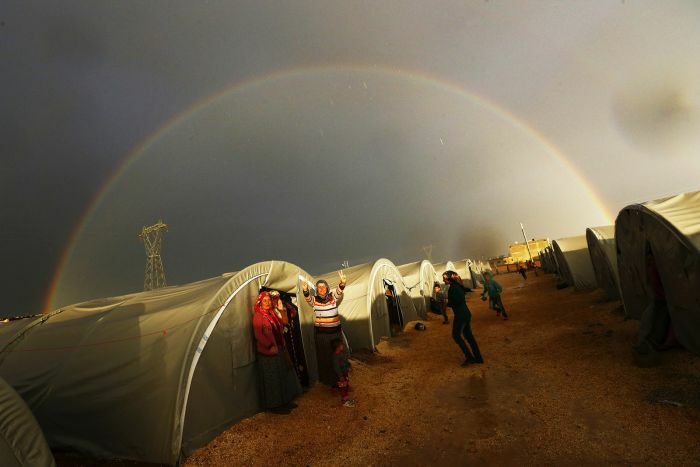 A Kurdish refugee from the Syrian town of Kobani shows a victory sign as a rainbow forms over the camp in the southeastern town of Suruc, Sanliurfa province, Oct. 16. 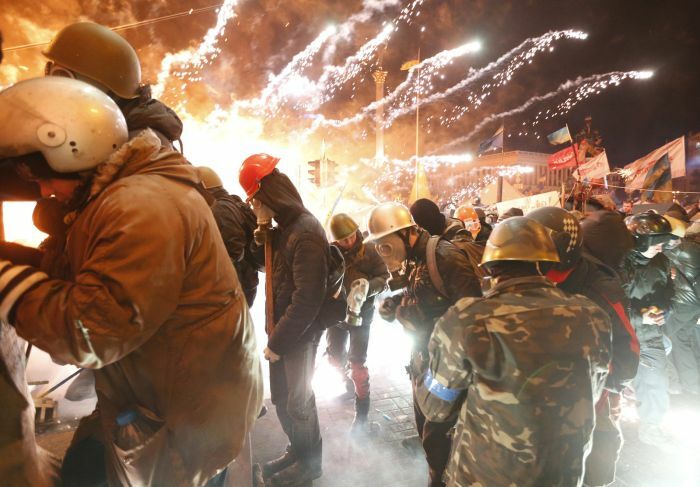 Fireworks explode near anti-government protesters during clashes with riot police at the Independence Square in Kiev, Feb. 18. 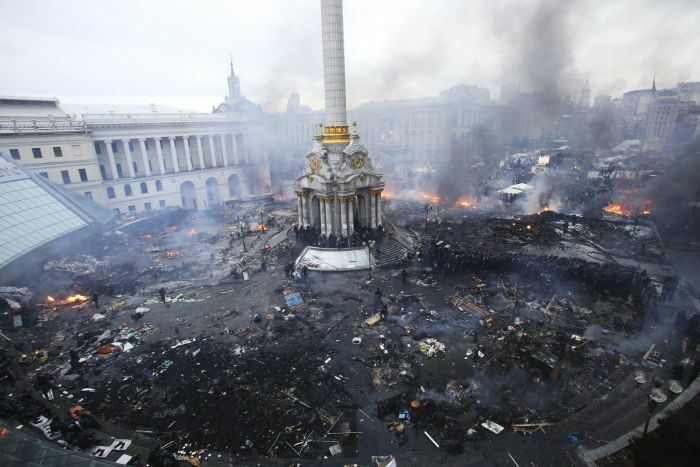 In Kiev Ukraine, an aerial view shows Independence Square during clashes between anti-government protesters, Interior Ministry members, and riot police on Feb. 19. 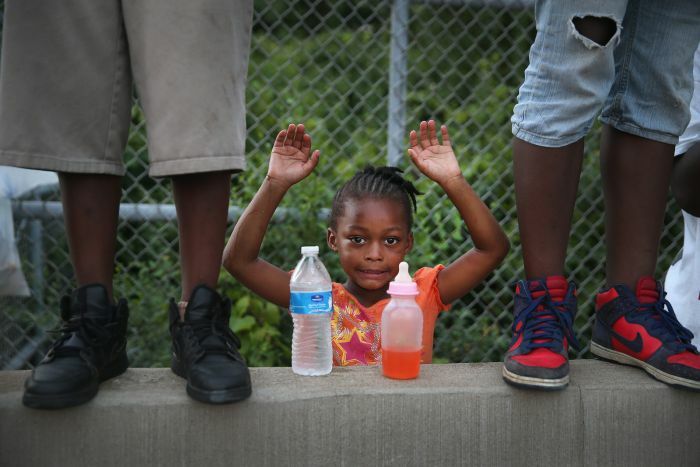 Gabrielle Walker, 5, protests the killing of teenager Michael Brown on Aug. 17 in Ferguson, Missouri. 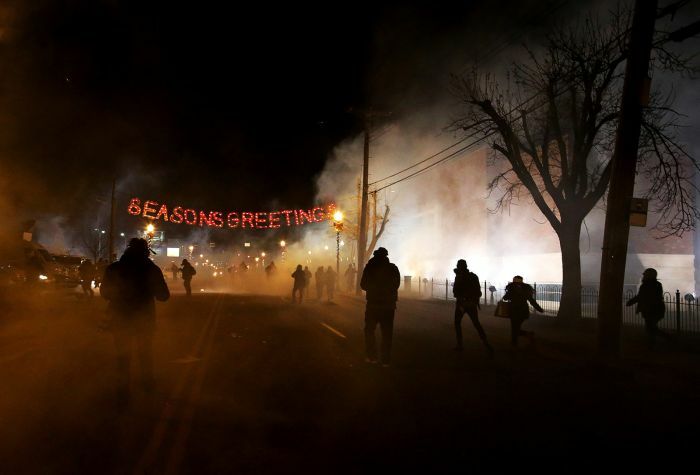 Protesters run away after police deployed tear gas during a demonstration on Nov. 24, in Ferguson, Missouri, after a St. Louis County grand jury decided not to indict Ferguson Police Officer Darren Wilson in the shooting of Michael Brown, which sparked riots in August. The amazing part is that among all the brave and wonderful people, overcoming hardship and injustice, acidcow decides to include number of spoiled and overprivileged 'human garbage'.